People 365, the leading HRM application based on Microsoft.Net technology, has been selected to be part of the Microsoft Communications and Media Global Outlook 2014 – 2017 guide. This guide from Microsoft provides insight into the Microsoft and partner technologies that are being developed for communications and media companies to drive positive change and address new trends. Topics around mobile, cloud and the Internet of Things are covered in the technology roadmap and regional perspective sections of the guide. 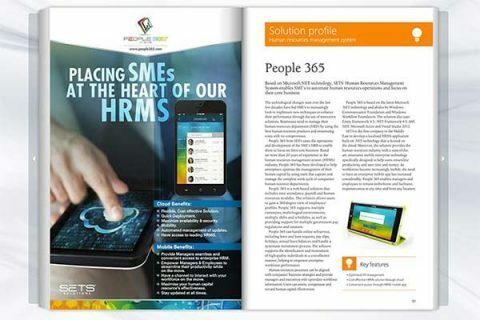 The published advertisement and article highlights the benefits of having an HRMS application hosted on the cloud and how the mobile application from People 365 can enable managers to work while on the move. SETS Successfully Participated at the Human Assets Expansion Summit 2014 in UAE! SETS, the market leading provider of Human Resources Management Solutions (HRMS) in the Middle East, concluded its participation as Bronze Sponsor of the 9th Annual Human Assets Expansion Summit MENA 2014 that took place in Dubai at the Grosvenor House on 14 & 15 May. The summit gathered many HR professionals from leading organizations who discussed the challenges they encounter in such a competitive and fast-changing market and shared their experiences. The two-day event, officially endorsed by the Ministry of Labor in UAE, revealed critical key strategies and drivers for growth in the HR function as well as best practices for a high performance workforce. Commenting on SETS participation at the HAES 2014, Maher Chahlawi, Chief Marketing Officer at SETS said, “Being an expert in the HRMS industry for more than 24 years, SETS is proud to take part of this annual summit, as we believe that nowadays, the HR function has become a vital player in setting and delivering any company’s strategic objectives. For that purpose, “People 365”, our leading HRMS, has been developed to support HRDs in managing and automating their HR operations, enabling them to focus on the company’s core business and maximize profitability”. With over 1,000 medium and large businesses that have chosen us as their HRM solutions provider, SETS has accumulated through the years, an in-depth expertise in HRMS offerings and is now recognized as a leader in the industry covering all verticals. SETS operates both regionally and globally, covering Lebanon, Jordan, Saudi Arabia, UAE, Qatar, Kuwait, Bahrain, Oman, Iraq and Algeria.